Very nice campground. All concrete sites with paved roads. Sites are close together but not so close as to be a bother at all. The campground is just a bit hilly so the entrance to some of the sites is just a bit steep for big rigs and I did see a few scrapes on the concrete however there were a ton a bit rigs there with toads. There is a restaurant and bar on site. We just had drinks but the burgers looked good. Easy access to the highway and because of that there was some highway noise. Nothing terrible. Just a few miles to Bricktown section of OKC. Lots of old buildings preserved and converted into bars, restaurants, etc. Easy parking at the Bass Pro Shops then walking distance to the minor league ballpark, OKC bombing memorial, and other attractions. Stayed 3 nights in a Class C Motorhome. Would definately stay there again. Didn’t use the showers but they looked neat and clean. Pulled in for a one night stay. But ended up staying two nights. Very relaxing camp ground, great grill/snack area, and friendly. Nice pull through sites. Handled our 42 fifth wheel easily. The campground is ok as a stop through point, but more than one night is not a good experience. Each site has its pluses and minuses. We had shade but no cable or wifi. Other sites with no shade are closer to clubhouse and can get wifi signal. And cable....well that just not true. We reported our cable out. I checked back one week later and was told they forgot about us, but put us on the list for repair when the cable guy came back. Checked back after another week. This time they were honest and said there would be no repair. The cable doesn't work and are looking for "someone" to bid on their business. They gave us the run around about the cable for 3 weeks. Truth is it doesn't work and my site mates confirmed it. Meanwhile, they are spending ridiculous amount of money beautifing the pond. There are two shower houses. One is clean but no a/c. You sweat as you shower. The other is dirty from heavy use but has a/c. Again pluses and minuses. This park was one of the prettiest parks we have seen. Despite being inside the city, it has a very isolated feel and is very quiet. The roads and sites are all paved and easy to navigate. The grounds are beautifully landscaped with ample trees, and picnic tables and fire pits in most sites. The grounds have rolling hills, but the RV sites are level. The amenities are very nice. The pool is very good but the hot tub is a bit small. Given the size of the park, they really could use a second hot tub. While we were there, the heater wasn't working, but they were actively trying to get it up and running. The fountain was also under construction work which was a bit of an eyesore, but the park was so lovely it was a minor distraction. The staff is very friendly and exceptionally helpful. There are many restaurants and attractions within a few miles of the park. We were only there for an overnight stay, but will definitely return for a longer trip. Nice resort. The pool was closed but the hot tub was open for use. The showers were spacious and hot. It's a bit of a challenge to get in and out of this resort, but that's not the resort's fault. We'd stay here again. Friendly staff, clean restrooms and showers, level concrete site pads, conveniently located, I thoroughly enjoyed my 4 night stay here. The only drawback was the wifi was extremely spotty, but they are currently upgrading their systems, so that should be fixed in a month or two. There is also some construction going on as they are adding a small grill area to sell hamburgers, etc., but that should also be done soon. My site was far from this, so I didn't notice any dust or noise. I would definitely stay again! WiFi tower is 50 feet away and still can't connect to Internet most of the time. Bathrooms are poorly maintained. Two showers in men's and women's, one broken in each. Very weak water pressure. Floors dirty, shower mats not picked up during cleaning. Suggest shower shoes at all times. Grounds attractive and sites well spaced. Traffic noise from I-40 constant but not too bad. Front office staff very,very slow to respond to person at counter if on phone or using private cell phone. Pool area attractive and well maintained. Bottom line: Things people see look good. But, the basics need more attention and repair..
Park is clean and easy to maneuver in with our RV. Concrete pads. Internet wasn't working while we were there but they had just had a huge storm blow a nearby transformer, Park does have a tornado shelter if needed. Staff was very helpful and gave easy directions to get to grocery store, Walmart, site, etc. Laundry rooms are clean and located on both ends of the lodge. Didn't use the bathrooms or showers so we're unable to rate. Pool and playground was fine. Splash pad wasn't running when we were there. Will definitely stay here again when we come through. Nice campground but the wifi is non existent and the cable doesn't work. People are nice enough but wish we had the services that were advertised. We stayed overnight and was placed into a space too small for our rig. I thought the spaces were crammed together a bit. I thought site layout was strange -- like they randomly stuck trailers anywhere they would fit, where it was aesthetically pleasing or not. It worked out, though. The staff was friendly and helpful. It has some lovely surroundings. Very nice clean park, convenient to alot activities locally. We were in front of the office and it was a bit noisy with traffic and the construction across the street on the soccer field was a mess, our camper and truck were both covered with the red clay dust from it being so dry but other than that it was a very nice place and the staff was extremely nice. We were even taken to the zoo in the limo to keep us from having to find a parking place for our dually which was a huge help. We will definitely be back here when we come into town. 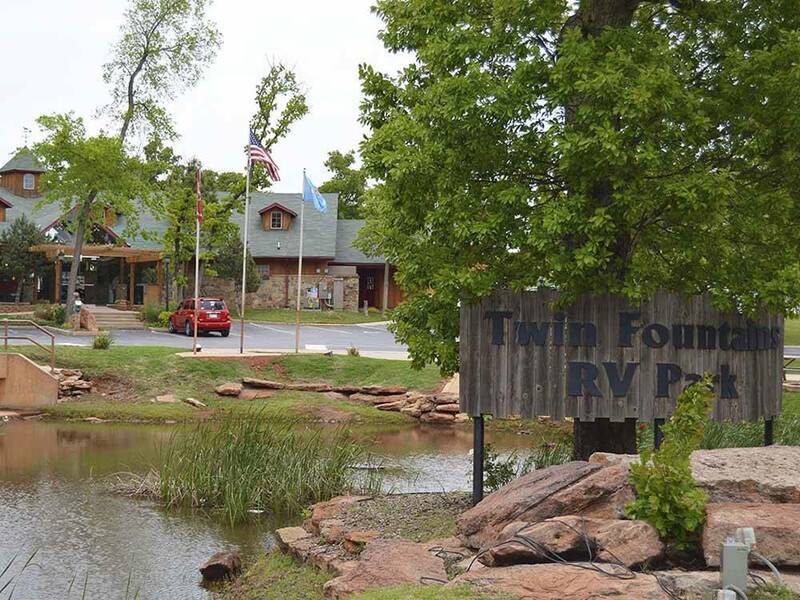 We stayed at Twin Fountains for an overnight stop. It is large and resort-like. The site was level on concrete and roomy with tree shade. There was some road noise as we were in the front row. I did not use the restroom so I cannot comment on that. I would stay here again.